Hey guys, the EBF5 public beta is back with version 0.7! I didn’t advertise the earlier versions much, because I didn’t want everyone to play it at once. But I guess I can open the flood gates now. Oh, and your old saved games should be compatible. Just import a save backup file from an earlier version. There’s not much left to do, only a few bugs and maybe a few balancing tweaks. I’ll probably be asking for translators in a few days, so stay tuned! If you translated some of my previous games, I’ll email you a bit in advance. 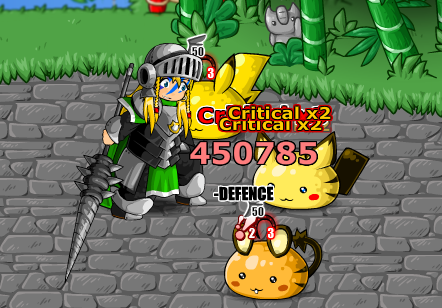 And look, you can do double and triple critical hits now! This is currently a bit of a secret feature, and isn’t documented in the game. This entry was posted in Epic Battle Fantasy 5 on September 17, 2018 by Matt Roszak. When I was about to go to sleep… now where was that amphetamine shot? So is the final boss done or is that still in the process of being finished? I think he’s nearly finished the animations..? He was halfway done with them a little while ago. I gave the final boss a lil taste test as soon as I could. IT WAS OUCH. rlly good. It took me a beat to beat the 1st phase of him with 1-2 levels below him. All on Epic difficulty ofc as I like the challenge. I can’t really say if the final boss in EBF3 was tougher than this one but he surely was annoying af and if you didn’t prepare yourself for certain aspects of him you’re doomed to lose even if you did beat his 1st phase. Yeah, he’s a challenge and mainly he hurts alot. I also got to say I had like 35 hours of playtime(did save up 10 hours for rushing trough the easiest game mode as I wanted to restart the game after the equipment, flair stuff got messed up), and this without premium content. So for me it feels like you got 3-times more playtime than you would have in EBF4, not including premium stuff. That’s A LOT! Also you got like 4-5-tmes more puzzles and riddles to solve which is challenging without any guides on doing them. The effort put into the game is definately worth the premium content even if the premium would be “meeh”(what I actually do not think, just saying). I just put all my hope in leveling the party nearly indefinately while remaining with some challenges scaling with the parties level. I gonna replay the game from start to finish on epic….. I know I’m going to want to kill myself, but I think I screwed up my chances at finishing up some of the quests anyways, and i want to get ALL OF THE MEDALS. I aint playin this. No spoilers for me. Your old data should still be there unless your browser deleted it. Anyways i would like to help you with the translations!!! I played a little of it! I can’t wait to play it completed! Now give enemies the ability to infinitely crit a party member. Wait, 2x crits are caused by critting with stagger, but, i’m still trying to find out how to get 3x crits, damn. Eventually the 3x crit is the crit on the crit? Like let’s say an enemy is staggered and has bad luck, you have good luck and brave, then the crit triggers extremely high. Like let’s say you have an insanly high crit chance of 210% on the target it would be a 10% chance for triple damage or such. Idk, just throwing out theories, but maybe you want to try it stacking Good Luck and Brave on yourself while applying bad luck and stagger on the enemy while using a skill with a very high critical rate(Like Cleaver). I’ve nerfed those battles slightly in the latest version, by a level or so. Not sure if you played the nerfed version or not. When I faced such pumped up foes I usually tried to have Limit Breaks prepared, had elemental affinities fitting to heavy hitting summons or used abilities which strongy CC’ed them like Freeze or killed them immediately with Death(or doom if you can delay, actually the doom flair works wonders there if enemies are under effect of bad-luck even better). Taking out foes 1by1 felt more efficient than taking out all of them rather than trying it at the same time. Also, there is one Fallen which gives you a +5 Morale buff when summoning(costs about 54 SP). It does Wind elemental damage on a single foe, and not just bit of it, taking out 1/4 or 1/2 of the enemies wasn’t unusual if he wasn’t wind resistant. Morale is best combined with Revive status because it’s like having 2-lifes and if you didn’t die you keep all your buffs on that character(re-buffing is awful). If you can’t effort SP, there’s an item, the cloud, which gives you up to 3-times more SP when killing foes, the only problem is, the character wearing it has to kill the foe, so it’s best used on characters like No Legs which finish off enemies with his jumping attack. Anna’s Volley Attacks are also a good finisher. The cloud’s wearer has to deal the killing blow!? Damn. The triple crit is the hidden big red text, right? Hi, I’m wondering if I’m able to use my backup saves for the steam release?